GRACIAS LE DOY A DIOS EL PADRE Y A JESUS NUESTRO SEÑOR, PORQUE GRACIAS A LA REDENCION DE NUESTRAS ALMAS, EL ALMA DEL HNO. DAVID WILKERSON NO PERMANECERA EN EL SEPULCRO NI PISARÁ EL HADES POR QUE SU ALMA ESTUVO ESCONDIDA EN CRISTO Y AHORA ESTA CON CRISTO. ESTA CON EL QUE AMÓ SIN HABERLE VISTO… ALELUYA!!! Y SI ALGUNA VEZ LLEGARÁ ESTE MENSAJE A LA FAMILIA DEL HNO. DAVID O ALGUIEN RELACIONADO QUE PUEDA HACERLES SABER QUE EN UN MOMENTO DIFICIL DE MI VIDA ME TOCO RECIBIR UNA PALABRA DE ESTE HERMANO QUE FUE USADO POR DIOS PARA SUSTENTARME. ABRIRE MI CORAZON, MOSTRANDO ALGO QUE NO HABIA MOSTRADO ANTES, PERO LO HAGO PARA DAR TESTIMONIO DE QUE EL HNO. 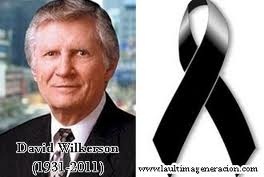 DAVID WILKERSON FUE PUESTA SU VIDA PARA BENDECIR A MUCHOS DE PARTE DEL SEÑOR JESUCRISTO. Y MI LLEGO A MI…. > The evil are attack me so much, it say me ” you can not live without sin, looser,” I want trust in Jesus, I love him, the devil’s lies are so real! “Jesus is not with you” ¡Jesus Save me! pray for me me please, the sin, the ******** problems, ********************, I don’t wana believe in the devil’s lies. I want Trust!!! I want Trust in you,I wish a real trust in you, Mercy Lord!! Thank you for writing and sharing this need. You can be assured that your prayer request will be prayed over by this ministry. This says to me that God is interested in the smallest detail of our lives. He is telling us how important we are to him: He is telling us we need fear no calamity, no situation, no crisis, no family or personal problem because he is there counting, overseeing, directing, and nothing shall by any means hurt you! “Therefore, do not fear!” Why? If God has taken the time to count your every hair, he has the time and interest to be concerned about all that affects your life! Rejoice – you matter to him! Esta palabra ha sido un gran consuelo en mi vida. Dios ayudame a llegar al final…. que no sea en valde la obra tuya y la de tus santos en mi vida.